FREE ESTIMATE. To buy, auction, sell or consign your Benjamin Franklin Letters between Theophilus and Eugenio, on the Moral Pravity of Man, and the Means of his Restoration for sale, please email Nate@NateDSanders.com or call the Nate D. Sanders Auction House (http://www.NateDSanders.com) office at (310) 440-2982. One of only 16 books printed by Benjamin Franklin, “Letters between Theophilus and Eugenio, on the Moral Pravity of Man, and the Means of his Restoration”. Philadelphia: Printed and Sold by B. [enjamin] Franklin, 1747. The first and only edition. Authorship of this volume of letters was once erroneously attributed to Franklin by Sabin, although it’s now believed to be by Sir Richard Blackmore. Book runs 64pp. in original wrappers, bound in full morocco black pebbled leather measuring 6.25″ x 7.75″ with git titling on spine. Previous owner’s name of “Andrew Reed” written to bottom of title page and page 20, possibly the wealthy 18th century Philadelphia merchant. Closed tear and water stain to title page, both lessening over the subsequent 2-3 leaves. Very good condition. Sold for $5,775. 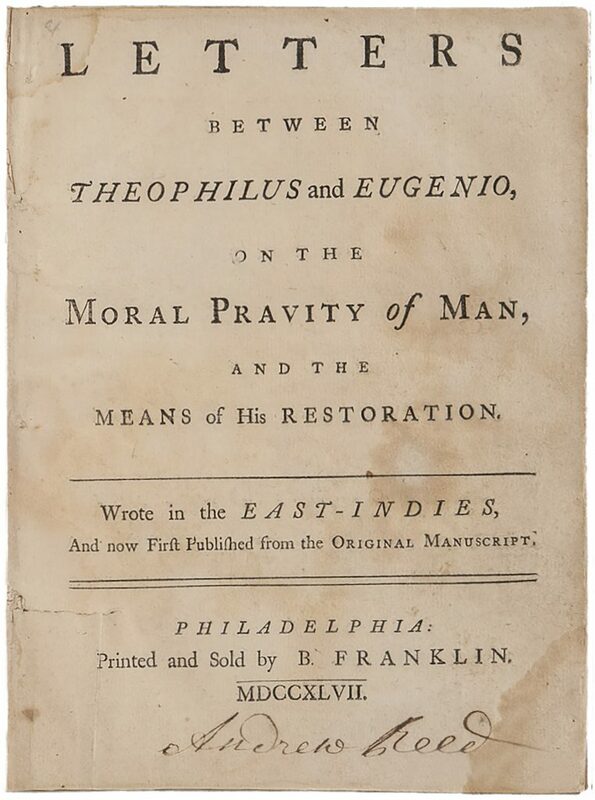 From the Printing Press of Benjamin Franklin, “Letters between Theophilus and Eugenio, on the Moral Pravity of Man, and the Means of his Restoration” — One of Only 16 Titles Published by Franklin. Click to enlarge. Appraise Benjamin Franklin Letters between Theophilus and Eugenio, on the Moral Pravity of Man, and the Means of his Restoration. Auction Benjamin Franklin Letters between Theophilus and Eugenio, on the Moral Pravity of Man, and the Means of his Restoration. Consign Benjamin Franklin Letters between Theophilus and Eugenio, on the Moral Pravity of Man, and the Means of his Restoration. Sell Benjamin Franklin Letters between Theophilus and Eugenio, on the Moral Pravity of Man, and the Means of his Restoration.